The following entry may contain triggering material and spoilers for The Mythology Class. First, I want to quote C.F. Cooper, erstwhile writer and editor for Marvel and author of Songs of the Metamythos (that I personally recommend a lot, a lot a lot): “The superhero genre is the last living bastion of mythmaking in … Western culture”. To be sure, movies and television shows about gifted, costumed vigilante heroes have been doing phenomenally well. I’d still like to focus on the visual-and-text medium that this genre may have once been inextricable from: comic books. Evidently, they’re called Graphic Novels now, which makes sense considering that the stories told in this medium aren’t always comedies. They could be tragedies, epics, romances, mysteries, fantasies, horrors, slice-of-life memoirs, and/or…new myths. And, as it turns out, not just in Western culture. The above panels are from Arnold Arre’s The Mythology Class. 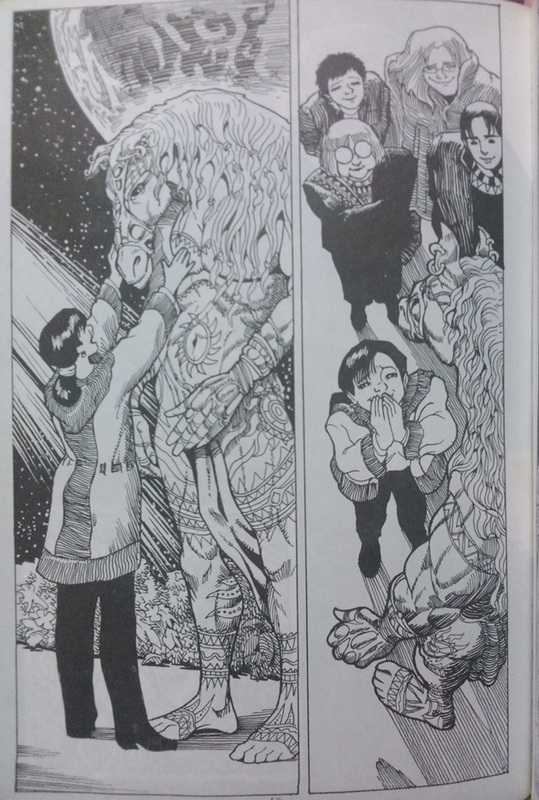 They show a folkloric being known as a tikbalang (that’s the man with the neck and head of a horse) and the reaction of the main character—a university student who’d recently flunked a thesis defense concerning her paper on Philippine mythology. She’s standing in the same room as a tikbalang for the first time in her life. The team, standing behind her, in charge of saving the world from the bad folkloric beings do also make some genre-appropriate effort to keep otherworldly shenanigans on the down low. Panel 3. Close up of the car’s wheels screeching to a halt. Panel 4. Kubin, with the eyes like pools of black ink, rushes the passenger-side window. Kubin’s speech bubble: “Dear Lady, I ask for your kind help!! It is of utmost importance that I reach this certain place!! !” Tala the Ghost floats beside Kubin, with a worried expression. I enjoyed the read, and I do recommend this a lot—a lot a lot. For the rare aesthetic, it incorporates a lot of familiar tropes. It might not be without its problems: too many expository conversations for a visual medium, way too many main characters to save a few from being extraneous, this vastly massive cast includes a token ethnic comic relief character who is the only one without a real backstory, and almost everyone couples up by the end like it’s Noah’s Ark. Still, it’s tightly-plotted, action-packed, at times genuinely funny and heartfelt. One of my favorite parts was when Rey (or was it Gio? Edward? Sam? These dudes all wear sunglasses all the time,) confesses his romantic feelings for Nicole the Probably Main-est Main Character, who reminds him that she already has a romantic subplot with Kubin the Occasionally Shirtless. Not-Kubin takes it amiably, they remain friends and comrades, and it never comes up again. The target audience for this might have an already-existing knowledge of local folklore. When the team rescue a sleeping child from some fancy stained-glass patterned bird, fans of occult dramas could easily figure out that the latter posed some danger to the former. It might be a different resonance if one’s been forced to study the ballad of the Ibong Adarna in grade school, and knows that the singing of this fabled magical bird causes a sleep from which it’s impossible to awaken. Well, unless you can find a wizard who would hand you a bucket of cold water…but as wizards don’t exist, I maintain that it is impossible to awaken from her magic song. On the other hand, this being an occult adventure-drama, this does meet the required definition of the rules of the world specific to this work. Arre took artistic license with doing away with the tikbalang’s traditional ungulate legs, and adding tribal tattoos and piercings. I appreciated the innovative design of the shokoy, too, and the environmentalist, monster-of-the-week subversive end to that plot point. Given that much possible variety, I can’t really pick on Arre’s aswang design, or the part the aswang play in the story, as different enough that they may as well have been called something else. On the 15th, I dreamed that I walked through the courtyard of my grade school campus. Sometimes it would continue into some garden spa that, of course, wasn’t part of the campus in waking life. My therapist had arrived, and then this giant cumulonimbus cloud tried to descend to meet us—meet my therapist, really, having mistaken my therapist to be some high-ranking member of this cloud’s holy order. Unless that wasn’t a mistake…hrmm… Anyway, what I remember next was walking on the sidewalk on the main avenue that (in waking life, too) linked all the university campuses, and meeting who I intuited to be the spirit of the road, or associated with the road or something. I remembered ey introducing emself as Guidon. (Which I wrote down, with much less difficulty than I usually have writing in dreams, so I didn’t glom onto the fact that this was a dream.) As we walked together, I remember feeling mildly amused and informed by the sheer amount of intellectual posturing that Guidon was doing. When I woke up, I ran the name through a search engine, and eventually wondered if I might have been prodded or might be called by Gwyddion. Then I thought to divulge this dream to my corporeal friend and roommate Cecilia, who gets more vocally irritated at the undergraduates who populate the now-gentrified Universityville. I described Guidon as that, because ey looked young and dressed in the fashionably unfashionable way of the Kids These Days, and seemed to have an awful lot to say about theoretical (theo-rhetorical?) matters. Eventually, Cecilia and I got back to grumbling about how, Back In Our Day, it was condiment pasta and farmer’s wet markets crowding the empty lots, not all these fancy schmancy restaurants in newly-constructed malls with giant air-conditioned grocery stores in the basement. I hadn’t know that. I must have just picked it up and forgotten it, let it steep in my subconscious until it comes out in a dream like this. Still, we had a good laugh about how the personification of the Avenue wasn’t just one of those brilliantly irritatingly twee undergrads, but an Atenean (with all the associated stereotypes born of university rivalries). Seriously, though, I’ve considered just leaving a clove cigarette and libation of Red Bull somewhere in the corner of the Avenue, to appease this minor dream-god of Young People Going Places, may ey forgive us nearly-elderly fogies our negative expressions of nostalgia. Cecilia and her family also invited me to stay with them in the Visayas for the summer. I’d heard so much about the place that I was excited to actually get to walk around in it, so that’s where I’m typing this from now. More later hopefully. Probably. The following entry contains poverty and eating disorders. If that statistic holds true, then Metro Manila doesn’t have it as bad—not that I’ve stood at the stoplights and taken a proper tally either. When I’ve been the one in the car, I’d say that maybe every fourth stoplight would have three to five beggars approach. Maybe every tenth stoplight, one of those beggars would appear adult (with an infant) or elderly (with an adult assistant, to aid the elderly in begging), but the rest are almost always children. Most times these children say that they’re sad because they haven’t eaten in so-and-so days, sometimes they’re offering to sell handmade garlands of sampaguita flowers, or lanterns (there’s a popular local Christmas song that starts out that way and continues, unironically, with pious holiday cheer…so, child labourers living in desolate poverty have become just another feature of the season), and sometimes they beg those in the car to buy something from them because they haven’t eaten in so-and-so days. I don’t as often find the ones who wipe down the windshield with rags anymore. As my mother wryly observed: Those ones aren’t paid for their windshield-cleaning service, they’re paid to stop trying to be helpful and to go away and bother somebody else. At the time, I really didn’t have spare change. I did have the privilege to wonder what it’s like to grow up like that, but I doubt that’s tenderable. When it had been an emotionally bad day (month…okay, year) I’d blogged that I was in an unenviable position. That wasn’t honest. Because I wrote that in English, on a blog that I can manage because I have the technology and knowledge, with a roof over my head, clothes on my somatypical-presenting body, and access to drinking water and food. I’ve gone to schools that taught me how manage a stock portfolio, because that’s the sort of thing that the adults in my life envisioned my older self would be doing. I still don’t feel as though any of those were or are mine. I live on a lot of luck, regardless, and I’ve got to admit it. That’s why I could relate a lot to this article, which I’d interpreted to be an excellent articulation of the orthogonal lines that (what I call) Glamour draws between social class and economic class. The System of modern civilized economy is broken and/or rigged, I’ve understood that much; Still, I haven’t made the best decisions that I could within it. My mother grew to resent supporting her children, especially feeding them, and I’d sensed this and took to starving myself (and suicide attempts—I’d recognized that I was a waste of a life.) The therapies to reverse that condition, physically and mentally, must have cost much more on average than the food I hadn’t eaten, and were a luxury of the middle class to even consider. Later, much later, after I’d stopped being sad and started getting angry, after my mother passed away from cancer, and after my sister had taken to substance abuse and physically abusing me…I did my best to leave. My sister had full control of the inheritance, a university education, a network of age-peers, and four years seniority that granted her touchpoint status with my mother’s peers. It’s probably a cultural thing, but then again, well… I had a 10th grade education at twenty-two years of age, no friends, no references, no clue, an uncontainably insane wellspring of pain and anger that made me out as someone you really want to bond with (not, it did not), fatigue, issues with attention and memory processes, and increasingly vivid hallucinations. I’d sought refuge with my godmother, who tried to reconcile my abuser and me; then with the estranged extended family, who tried to reconcile my abuser and me. I discovered a boarding house that rented cheaply, moved out, and continued writing transcriptions. Unlike articles, blog posts, or fiction my mind at the time could actually accomplish this (and now it still can, along with articles, blog posts, and fictions. I’ve recovered a lot. Not enough. And not without collateral damage. But a lot.) And on the way out of my abuser’s dominion, I had stolen our deceased mother’s secondhand laptop. This was about five or six years ago, and what with technological obsolescence and lacking the funds to upgrade have limited my options with freelance writing and navigating those job sites…but, this laptop still turns on when I press the button, still saves text documents, still lets me edit sound and image files. I should know how to make something of this. Still, I starved to make rent and utility payments that I still fell behind twice. And, my uncle had been right: it was different. There’s a lot of fuss about food, and I’m not proposing that calories vitamins minerals lipids essential-acids and textures (yes, textures; try chowing down on a tough stick of barbecue when you’ve got a sore throat, and then maybe imagine that you don’t even have molar teeth because they rotted away because you can’t pay for dental care,) and flavors are unimportant. It’s just that—first, once I couldn’t “cheat” because I was living in poverty, it was dehydration that I suffered the most from. After my middle-class eating disorder, I don’t get hungry anymore: I start to guess that I should have eaten something when I start to feel dizzy. Thirst, on the other hand, razed and swelled the inside of my throat up so it hurt to swallow and it was difficult to breathe, and lowered my blood pressure so I was always seeing colors if I tried to stand and walk. I could survive more days without food than I’d given myself credit for. Without water to drink? Less time—I say, vaguely, because I didn’t try to test this. Second, unlike with the life of luxury I left, I didn’t want to test this. I still didn’t want to be a bother—I hate that between my sister and Cecilia are a string of people who my plight moved to invite me into their homes and I have failed so many people so many times—I don’t want to be as stuck as I am on their lack of hospitality that I can’t speak the thanks for sheltering me as long as they did and own where I fucked up (but I am, and I can’t, and I don’t), I didn’t want my eighteen-year-old cousin sleeping in the same bed as both her parents because they gave me her bed and all I did in it was lay in it and cry, I didn’t want my godmother to have had to ask my sister to give me an allowance from her inheritance and them both tsking as I fail to pull my bootstraps up—but, away from all that, alone with the memories of all that, somehow, that’s when I felt sure that I didn’t want to die. The best meal in my life that I can remember was from this time. I didn’t have a kitchen, or anything to cook with. Gentrification hadn’t taken the neighborhood so I’d walked the street and cobbled a meal together from here and there. One cup of white rice from a canteen. Three large, griddle-roasted pig’s ears on a stick, from the unbranded barbecue set on the corner (manned by one lady with a tray stacked with pig’s ears, chicken intestines, cubes of coagulated blood, and—oh, but fifteen more pesos on that and I wouldn’t be able to afford a peanut butter sandwich for breakfast the next morning, and the evening after that I expected the bank transfer from my freelance writing online to come through, never mind, I’ll stick with the pig’s ears—barbecue). And, one “snack pack” sachet of beans in tomato sauce, from a mom-and-pop general store that was about the size of a closet. I went back to my room, put it all together. It was tasty. The rice was adequate—not burnt or stale or the cardboard-y quality that usually goes to farm animals (but people who run a small business like a canteen sneak it to people, to cut costs, not that I blame them). The ears were crisp and brushed with the most perfectly balanced barbecue sauce I’d ever tasted, and the tomato beans rounded it all off. It had more than that. Folklore warns against eating fairy food. If a bowl of milk went as an offering to the fairies, then they’ve taken the essence—what I call Wildeval, a conceptual point or object in the process that is Glamour—and eating it will leave a person insatiably hungry. If you wander into Fairyland and get curious about the canapes at some party over there, be warned that by eating it you’ll belong to them forever. That’s a clue as to how Wildeval works, too. But, I realized, everyone does something to the Glamour societal (not only the Glamour mystical, the fairy’s magics—or maybe it’s the same.) This was the first meal I can remember that didn’t taste of resentment and obligation. This, I believe, was food that managed to keep its Wildeval. Or do I imagine it was there? I imagine that my uncle would refuse to take this the way I meant, that starvation from poverty is in any way better than some vain, neurotic, attempt at emotional blackmail via two-year tantrum over nothing, and that’s all. Though he’d never said this, it’s his voice most of all that echoes in my mind, sarcastically: Go ahead, fine, live like that. Torn shoes, tattered shirts, and a bowl of pig’s ears to eat every three days. You’re happy like that, without family, without support, without a future? Be happy while you’re crazy, then! Be happy while you’re sick in the head, be happy while you’re poor—It all only proves that you deserve it. You’re right where you belong. You’re a waste of love and life, and too spoiled from your childhood to ever wake up to such an obvious fact. I just do, I can’t help it. …Now where can I put this contrarian energy? I’ve added a fourth part to this fanfiction trilogy, Songs of the Sunset (previously Spectrum) for the Otherfaith, and noticed that the Wastes are a landscape that I find my imagination drawn to. Not necessarily one that I’m confident in having the mindset to understand, though. This despite my living in a third world country and this year’s monsoon season started strong. The Wastes are the part of the Otherfaith otherworld associated with the Ophelia. As the Ophelia is a god of cleansing, the Wastes are hers, full of what gets cleansed: the waste products of civilization. In my experience, this definitely includes people. I try to write more as a way to figure the place out. As a possible metaphor for how the Calvinist linage of philosophy survives Stateside as detailed in Alley Valkyrie’s article linked above (or, hey, I think it’s well worth linking again), and an exploration as to how that interacts with the presumption of absolute personal sovereignty? Irene holstered her own gun and pointed at where Sham lay. Their mission was technically accomplished. The princess reached into her back pocket for a plastic card, which she offered to Lyra. It glinted with holograms. Irene looked mildly confused for a moment, shrugged in the next, and nudge-fanned the air until the hunter accepted. I like the idea that Irene’s an old world fairy, from where the gold disappears at dawn. My headcanon of her understands that gold can be exchanged for goods and services, but misunderstands the value of it as residing in the shiny and the pretty. Not for the way a currency represents time, effort, agency, dignity, innate worth, communal consideration of worth, and luck or lack thereof in life circumstance. She may (or may not) benefit from holding the title of Princess in a world where not everybody does, but I’d argue that as far as economic classism goes, she’s innocent. Irene hadn’t known enough of the language to ask why the West wouldn’t send supplies, and stop the spirits from becoming ghosts, or even spare them the unnecessary suffering. Too innocent. The answer to this might have simply been that noblesse oblige is more complicated than that. Listening to the beneficiaries is the easy way. There are harder ways to learn what poverty is like, and then what to do to help.